Course Announcements Announcements about the course will be posted here. Please check the site regularly for announcements (which will also be given in lecture and/or in recitation). Here are some notes on Jordan normal form (pdf, dvi, ps). I wrote up some notes on the spectral theorem for self-adjoint operators on a finite dimensional inner product space (pdf, dvi, ps). The scores on the diagnostic quiz are now available on Blackboard. All scores of 31 or higher earn the extra 0.5% credit. For students who earned a score below 30, please schedule an appointment with me to discuss your background for this course. The week of Sept. 27th  Oct. 3rd, Jason Starr's Thursday office hours will be rescheduled due to another commitment. There will be office hours in Math 4-108 from 1:302:30pm on Wednesday, Sept. 30th. And Jason will tutor in the MLC from 3:45&151;4:45pm on Wednesday, Sept. 30th. Stony Brook has a correction day on Tuesday, September 29th. There is lecture as usual on Tuesday, September 22nd. Because of a conflict with a scheduled university event, the diagnostic quiz originally scheduled for Thursday, Sept. 17th will be rescheduled to Thursday, Sept. 24th. Course Description The description in the graduate bulletin: Groups: normal subgroups, quotient groups, Lagrange's theorem, class formula, finite p-groups and solvable groups, Sylow's theorems, finitely generated abelian groups. Rings and modules: subrings, fields, prime and maximal ideals, quotient rings, ID's, PID's, UFD's, polynomial rings, field of fractions, the Wedderburn theorem, Hilbert basis theorem, finitely generated modules over a PID. Vector spaces: basis, linear maps and matrices, dual spaces, determinants, eigen values and vectors, inner products, spectral theorem for normal operators. Prerequisites For graduate students in the mathematics Ph.D. program, there is no prerequisite. All other students should consult with the instructor regarding prerequisites. 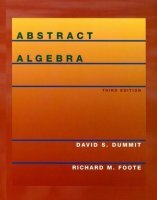 David S. Dummitt and Richard M. Foote, Abstract algebra, 3rd ed. available at the University Bookstore @ Stony Brook. A copy of the textbook will be on reserve in the Mathematics, Physics and Astronomy Library. Also you are encouraged to look for new or used copies of the book through other retailers or through your fellow graduate students. This is the same textbook used in the past, and I am sure there are good bargains to be had. Lectures The instructor for this course is Jason Starr. All instruction will occur in lectures. There are assigned readings in the syllabus which are to be completed before lecture. During lecture the instructor and the students will discuss the material in those readings, there will be exercises to practice the material, etc. For the lectures to be effective, you must complete the assigned reading from the syllabus before lecture. Lecture is held Tuesdays and Thursdays, 9:50  11:10AM in Earth and Space Sciences 183. For new students, ESS is at the top of C5 in the online campus map. Office hours are Monday and Thursday, 34pm. They will be held in Math Tower 4-108. Regarding problem sets and class participation, this fraction of the grade will mostly be determined by scores on the problem sets. However, especially if there are problems with low attendance, some fraction may be determined by attendance, class participation, performance on pop quizzes, etc. (in that case, the distribution of the 25% will probably be 20% problem sets, 5% class participation). Graded problem sets and exams will be handed back in lecture. If you cannot attend the lecture in which a problem set or exam is handed back, it is your responsibility to contact your instructor and arrange a time to pick up the work (typically in office hours). You are responsible for collecting any graded work by the end of the semester. After the end of the semester, the instructor is no longer responsible for returning your graded work. Disability Support Services If you have a physical, psychological, medical or learning disability that may impact your course work, please contact Disability Support Services, 128 ECC Building (631) 632-6748. They will determine with you what accommodations are necessary and appropriate. All information and documentation is confidential. Academic Integrity Each student must pursue his or her academic goals honestly and be personally accountable for all submitted work. Representing another person's work as your own is always wrong. Faculty are required to report any suspected instance of academic dishonesty to the Academic Judiciary. For more comprehensive information on academic integrity, including categories of academic dishonesty, please refer to the academic judiciary website at http://www.stonybrook.edu/uaa/academicjudiciary/. Critical Incident Management Stony Brook University expects students to respect the rights, privileges, and property of other people. Faculty are required to report to the Office of Judicial Affairs any disruptive behavior that interrupts their ability to teach, compromises the safety of the learning environment, and/or inhibits students' ability to learn.